By almost any measure, it’s safe to call Las Vegas a city of extremes. The casinos. The lifestyles. The entertainment. The climate. My hotel room must have been 60 degrees — I’m convinced, to somehow make a feeble attempt to compensate for the broiler-oven temperatures outside. If you’ve ever experienced this kind of desert heat, you know it’s not like a temperature as much as it’s like a tangible object, slapping you between the eyes every time you leave the confines of a building. It turns out, an overly-AC’d room can be just as jarring… though I admit, it was usually a welcome respite. But the extremes of Vegas are no longer contained to The Strip. They’re headed downtown… and the extremes here are all about creativity and community. Well, it’s starting to be different. 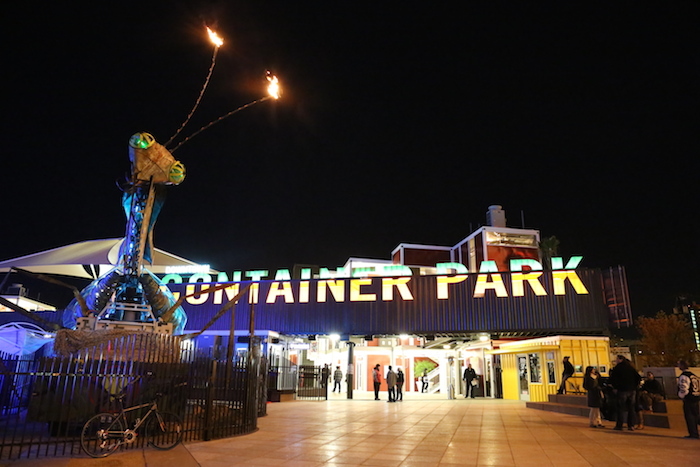 Enter the Downtown Project, a social experiment at an almost unbelievably large-scale, existing to completely transform and revitalize downtown Las Vegas. To be specific, they’ve allocated $350 million — $200 million in real estate, $50 million in small businesses, $50 million in education, and $50 million in tech startups to get the job done. But having been there, I can tell you this venture isn’t really about the money. For example, the Downtown Project is borderline-obsessive about measuring things like “collisions,” (one of my own personal favorite words to describe bringing people together). Also, the philosophical underpinnings of how “community” becomes tangible have been rigorously detailed, and more impressively, are woven into the way that everything seems to work on the ground, from the tour guides to the security folks (called Rangers), to the small business owners. As of this writing, they claim that 893 jobs have been created. And every single person you meet Downtown is incredibly, amazingly nice. I found myself leaving the city inspired and energized (two words I don’t generally associate with a multi-day trip to Vegas), and incredibly excited to come back and visit again soon. My experience at Creativ Week also left me pondering a number of other things, including the symbiotic relationship of a city and its creative class, and the generative dance that takes place between investors and entrepreneurs — at least, when said investors truly care deeply about the local community. I’m quite certain I only bit off a tiny slice of what’s actually happening here, and given their ambitious goals — I remember seeing somewhere that they aim to make Downtown Las Vegas the most community-focused city in America — I have no doubt that they’re just getting started.